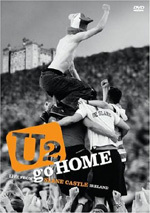 Today’s nominee for “Most Puzzling DVD Release of 2003”: U2 Go Home: Live From Slane Castle. 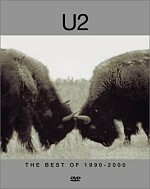 On video, U2 released reasonably good documentation of five tours since 1983. To date, three remain unavailable on DVD: 1983’s Under a Blood Red Sky, 1993’s ZooTV Live From Sydney, and 1997’s PopMart Live From Mexico City. At least two of those received release announcements that later got cancelled. So for the latest U2 DVD, do we get any of those highly desired products? Nope. Instead, we get the September 1, 2001 Slane concert, a representation of a tour already documented in 2001’s Elevation DVD. Shot less than three months after the Boston concerts depicted in Elevation, the Slane concert marked the end of the band’s second leg of the 2001 tour. It also presented their final show prior to September 11. As I noted in my Elevation review, U2 returned to the US for the tour’s third leg just weeks after 9/11, and those concerts took them to another level of intensity and power. I’d gladly embrace a DVD release of one of those shows; their 10/19/01 performance in Baltimore was easily the best of the 27 I’ve seen. But Slane offers something of a different beast. I provided detailed explorations of my thoughts on U2 circa 2001 in my Elevation review. If you’re curious about that topic, please consult the prior article. Here I’d rather examine comparisons between the two releases. Whereas the Boston DVD documents some “ordinary” concerts, Slane presents something more special. In 2001, U2 did only two shows on their home turf in Ireland; they also played Slane about a week prior to the concert depicted here. During an arena tour, these marked their only stadium gigs. With a crowd of about 80,000, Slane offered a massive and majestic setting for the band’s “homecoming”. The Slane shows also were a sad time for the band. Bono’s father died on August 21, 2001, so all the performances around that time received an extra emotional charge. That comes out in Slane, as we can see Bono actively work through his feelings via the concert. It’s that tone that makes Slane a more special event than the “ordinary concert” depicted in Elevation. In regard to their setlists, the pair present many similarities. 11 of Slane’s 20 tracks (including a bonus number) also appear on the prior DVD: “Elevation”, “Beautiful Day”, “Until the End of the World”, “Stuck In a Moment You Can’t Get Out Of”, “Kite”, “Sunday Bloody Sunday”, “Desire”, “Where the Streets Have No Name”, “Bullet the Blue Sky”, “With or Without You”, and “Walk On”. In addition, “Wake Up Dead Man” shows up in both sets, though Slane presents a longer version; it’s still not the full-length rendering from Pop, but it’s closer than the snippet heard in Elevation. Slane includes seven songs that don’t appear in Elevation: “New Year’s Day”, “Out of Control”, “Angel of Harlem”, “Staring at the Sun”, “All I Want Is You”, “One”, and “Mysterious Ways”. (The latter shows up as a bonus track and isn’t part of the program proper.) As for Elevation songs the band didn’t play at Slane, we lose “Gone”, “New York”, “I Will Follow”, “In a Little While”, “Stay (Faraway, So Close! )”, “Bad”, and “The Fly”. Taken on its merits as a concert, Slane easily outshines Elevation. The latter DVD depicts good but unexceptional shows with a number of warts. In particular, Bono’s voice was in rough shape during the Boston concerts, whereas he sounds much better at Slane. The band pour a level of intensity into the show that doesn’t appear in Elevation as well. All the factors converge here. From the emotion related to the death of Bono’s dad to the setting to the show’s placement as the end of the European leg, this one had the markings of an Event, and the band lived up to that with a solid performance. Not surprisingly, it feels like Bono’s dad hovers over the concert. He receives mention during a charming story in “Out of Control” as well as before “Kite”. Bono also infuses passion into “Sunday Bloody Sunday” when he declaims the names of victims of the “Omagh bombing” in 1998, apparently the deadliest act of terrorism during the Irish woes. Overall, the entire band simply seem much more fiery than in Boston, and the show takes flight because of that. Bono even pulls out the much-loved “shine like stars” bit for “With or Without You”! Hamish Hamilton directs both programs, but he demonstrates much greater editorial restraint in Slane. For Elevation, he attempted to give the show a pseudo-documentary feel, which meant lots of awkward shots and jerky camerawork. At times, the quick cutting on Slane gets a little dizzying, but for the most part, the show progresses at a more reasonable pace that doesn’t overwhelm the viewer. Hamilton does little to make the concert work tremendously well on video, and it takes him a little while to find his footing; the early songs are somewhat uncertain. Nonetheless, the presentation mostly seems solid and it depicts the show in an accurate and efficient manner. Overall, I find a lot to like about U2 Go Home. It offers a very good concert in a fairly compelling manner. While not the best concert presentation I’ve seen, it’s one of the better U2 products on the market, and it definitely outdoes the less than stellar Elevation. 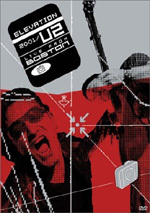 U2 Go Home: Live From Slane Castle appears in an aspect ratio of approximately 1.78:1 on this single-sided, double-layered DVD; the image has been enhanced for 16X9 televisions. While erratic, Slane offered a generally attractive picture that definitely marked an improvement over the disappointing visuals of Elevation. Sharpness still came across as iffy at times, though not with the frequency seen in the earlier project. Occasional shots looked a bit soft and ill defined, but those popped up on an acceptably rare basis. For the most part, the show looked nicely detailed and distinctive. Some examples of jagged edges appeared at times, and I noticed a little light edge enhancement as well. Periodic examples of video artifacting manifested themselves, but those also remained minor and didn’t create any real distractions. As I noted when I reviewed Elevation, U2 circa 2001 didn’t present a terrible color-filled concert, so don’t expect a lot of dazzling hues here. Nonetheless, the tones looked noticeable more accurate and dynamic here than in Elevation. The latter displayed a flat, brownish feel, whereas Home looked accurate and concise in its colors. Blacks were reasonably deep and tight, and the program handled low-light shots surprisingly well. Some variations occurred, especially via one camera that made everything look brighter than any of the others. Nonetheless, that problem occurred infrequently, and the image usually appeared well balanced. Overall, U2 Go Home didn’t offer one of the strongest pictures I’ve seen, but it seemed generally solid. Whereas Elevation presented only a Dolby Digital 5.1 soundtrack, U2 Go Home added a DTS 5.1 mix to the equation. That’s a nice touch, but don’t expect tremendous differences between the pair. The DTS track might seem slightly deeper and richer, but this didn’t present an enormous improvement. It also was a little broader and more encompassing in scope. I’d give the DTS version a slight nod, but I didn’t discern enough variations to award it a higher score. The sound field remained pretty heavily anchored toward the front spectrum, but that seemed appropriate for the presentation. Vocals were well placed in the center, while instrumentation spread cleanly and accurately across the forward channels. The rears mainly added musical atmosphere as well as crowd noise. They didn’t feature much split-surround information, but they bolstered the music in a surprisingly strong and effective manner. This allowed the music to neatly envelope the listener. Audio quality sounded excellent. Bono’s vocals maintained terrific presence and they always sounded warm and natural. Edge’s guitar displayed fine clarity and precision, while Adam’s bass received good support and depth. Larry’s drumming was clean and distinct and showed none of the “boxiness” that often affects concert percussion. Dynamics were very good, and the program presented some very warm and rich bass. Whichever soundtrack you choose, you should find a lot to like about the terrific audio of Slane. Although Slane lacks the bells and whistles of Elevation, it tosses in a few nice components. The main attraction comes from The Making of The Unforgettable Fire, a 28-minute documentary shot in May and June of 1984. Filmed during the Unforgettable Fire sessions at Slane Castle and subsequent work at Windmill Lane Studio in Dublin, we watch U2 as they work on the record and also get occasional interview snippets with the band as well as manager Paul McGuinness and producers Brian Eno and Daniel Lanois. Mostly they work through “Pride (In the Name of Love)”, but some other tracks pop up too. A very interesting program, the shots from the sessions stand out as the most compelling components. The interviews add some useful notes about the various songwriting and recording processes, but it’s really the candid elements that make the show special. We get to observe details of the band’s work plus some fun moments such as when a local girl asks Eno if Quincy Jones was there. It’s a solid little piece. Next we find a bonus track. This presents “Mysterious Ways” with a 16X9 enhanced 1.78:1 image and PCM stereo audio. The performance comes from the same Slane concert depicted on the main part of the DVD, which makes its excision from that program a mystery. Why not include it between “Where the Streets Have No Name” and “Pride” where it belongs? I have no idea, but I suppose it’s better to get it as a bonus than lose it totally. Too bad the presentation’s more than slightly jarring. This cut of “Ways” looks more like something from the pseudo-documentary Elevation than the more traditional Slane. It shows lots of intentionally degraded footage and jerky camerawork. These make it borderline unwatchable at times. Still, it’s a decent performance. Finally, DVD-ROM users will find a few additional components. The most intriguing promises a 360-degree view of Slane. This is available for three songs: “Elevation”, “Where the Streets Have No Name” and “Beautiful Day”. It allows you to pan all around the venue. In theory, this seems cool, but the execution becomes less scintillating because the image looks simply horrid. Technology hasn’t progressed far enough to catch up with the piece’s concept, as the picture looked terribly blocky and unwatchable. Somewhat more interesting is the “U2 Elevation Tour Diary Calendar and Clock”. When you download this, it’ll show a clock with the current time and allow you to jump around the calendar to find out where they played each day of the 2001 tour. I found no “tour diary” elements, though; other than city and venue, I couldn’t discover any details about the shows. Finally, we get some “weblinks” to U2’s homepage as well as some for causes they support; we get connections to DataData (“Debts, AIDS, Free Trade in Africa), ”Free (Leonard) Peltier”, Greenpeace, the Burma Project, and Amnesty International. In addition, we discover two screensavers and four wallpapers. All seem decent but pedestrian. As one of my favorite bands, I was pleased to check out U2 Go Home: Live at Slane Castle. 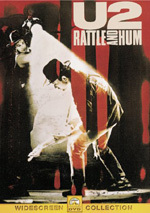 The DVD offered a very good concert in a solid manner that rarely suffered from gimmicks or silly editorial techniques. Picture quality was occasionally iffy but usually seemed solid, and the audio sounded consistently terrific. The package comes with a few extras highlighted by an interesting documentary from 1984. When it comes time for recommendation, things become complex due to the pre-existing Elevation release. If you don’t already own that DVD, I’d advise you to get Slane instead. It doesn’t include as many extras, but it presents a better concert with superior picture and equally terrific audio. If you have Elevation but simply adore U2, you’ll also want to get Slane. I know that I’ll keep both in my collection, especially since a smattering of different songs appears between them. More casual fans who already own Elevation will probably feel content to stick with it, if they’re content with it. If you have it but don’t care for the picture quality or other presentation aspects, Slane offers a nice upgrade. Despite a more restricted roster of supplements, Slane simply seems to be the superior U2 concert release of the pair from 2001. One final note: if you peruse online retailers, you’ll find two different editions of Slane for sale. There’s a “Limited Deluxe Edition” that lists for $26.98 and an apparently undeluxe, unlimited version that goes for $19.98. As far as I can tell, the only difference between the two involves packaging. The more expensive release comes in a digipak, while the cheaper one gets housed in a jewel case. Otherwise, it appears that the DVDs themselves remain identical and the “Limited Deluxe Edition” includes nothing not found in the jewel case package. If you want to spend an extra $7 for a digipak, go for it. I’d recommend the cheaper one for everyone else, though.